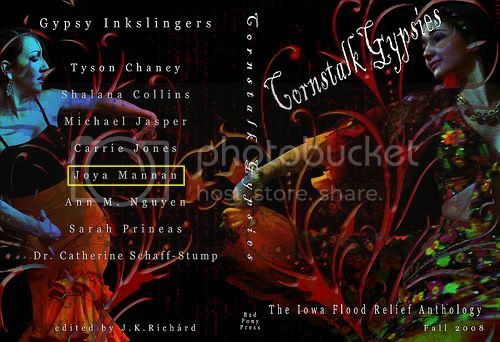 Cornstalk Gypsies: The Iowa Flood Relief Anthology, a 230-page science-fiction/fantasy anthology, is finally available! Click here to purchase a paperback copy for $13.00 (plus shipping) or a digital PDF copy for $4.95. My story, "A Spell of Winter," is in the anthology. It features a dwarf, a crazy swarm of fairies, and a couple humans (for good measure)! Most importantly, though, 100% of the proceeds from this anthology will go towards relief of individuals, businesses, cities, and schools affected by the 2008 summer floods in Iowa. So, if you buy this anthology, every cent of your money will be helping people! Please feel free to pimp the anthology on your own journals, too. Not only because my story's published in it, but because every copy sold will help victims of the Iowa floods!